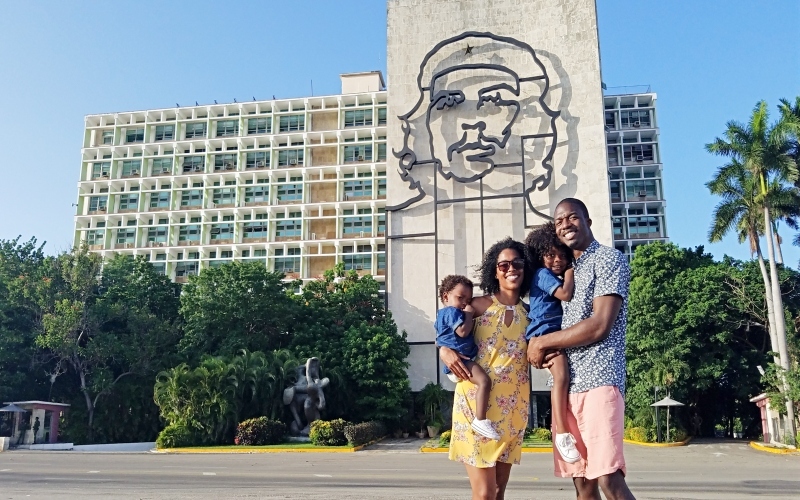 Visiting Cuba has been a dream for us. So when the Obama administration opened visits up to US citizens we had to take advantage. We spend 4 days in Havana eating, taking in the culture, and having the time of our lives. We’ve laid out some things to do in Havana, Cuba to help you plan your own trip. Even if you only have 3 days in Havana you’ll thoroughly enjoy your time but don’t be surprised if you want to come back for more! 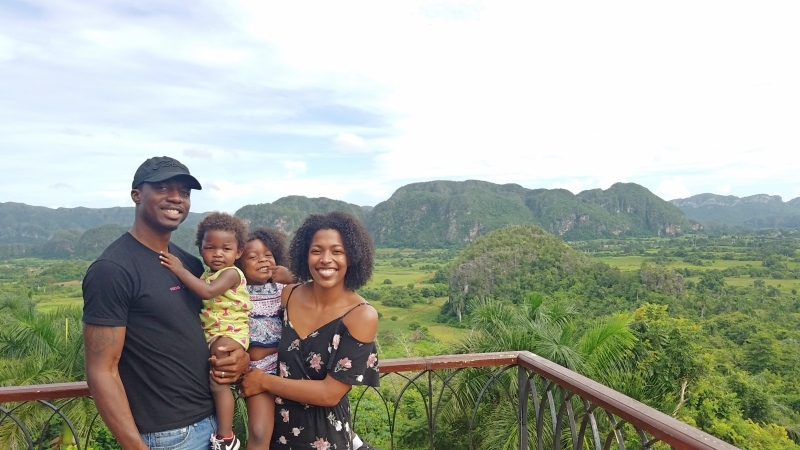 With only a handful of Airlines to choose from with flights to Havana we were excited our favorite, JetBlue, was an option. We flew direct from Fort Lauderdale to Havana with a flight time of 45 minutes. The process with JetBlue was so smooth! We arrived at the airport at 6AM for our 8:15AM flight. They had an entire counter of 6 agents who were only checking in guests going to Cuba. 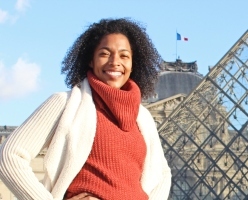 We pre-selected our Visa category, Educational Activities including People to People, when booking our flight and paid the $50 per person with the agent who checked us in. It is $50 even for lap infants and you can pay with a credit card. By 7AM we were already through security and at the gate. We were the only flight that arrived to our terminal at that specific time and they had a ton of lines open. We got through in 10 minutes. If there are two parents with two kids you will each have to go up separately one parent with one child. They were very amendment about this and would not allow our entire family at the immigration counter at once. Like many suggested we exchanged our US dollars to Euros before departing the states. To be honest I don’t know that it saved us any money. We exchanged $1,200, which only got us 960 Euros. At the airport our 960 Euros got us $1016 CUC. The currency exchange is right outside of the terminal to the right. On our return home the JetBlue agent at check in exchanged our CUC back to USD for us at an exchange rate for 1CUC to $1, a much better exchange rate than we got upon arrival and that the currency exchange was offering. We had no idea exchanging it through JetBlue was even an option but when the agent saw our funds she offered. There were 4 of us and she exchanged all of our money back, a total of $590 so it didn’t seem as if there was a limit. US citizens cannot stay in government owned hotels. For the best experience most people recommend booking a Casa Particular and for good reason. A Casa Particular is owned by Cuban residents and is in their home. Some are shared where you will only have a private room but there are many options to rent an entire home. We booked this Casa Particular through Airbnb. 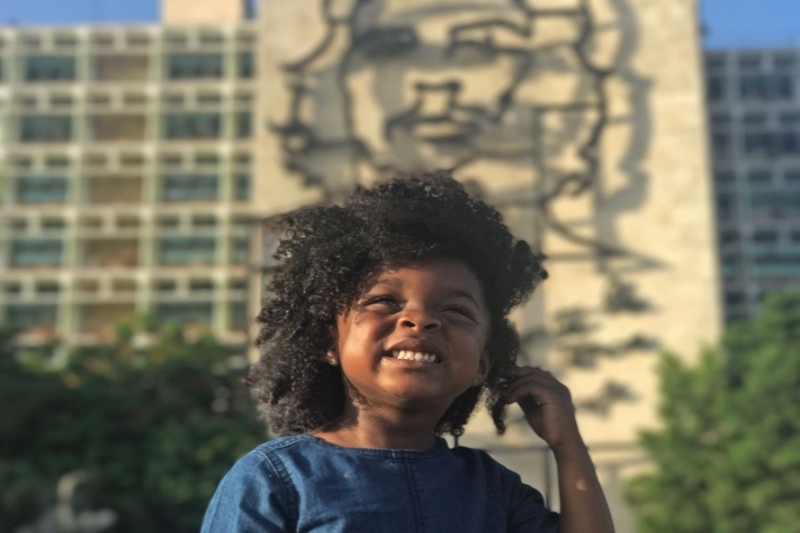 After much research we decided on staying in the Vedado neighborhood of Havana. Our home was in the perfect location. It was right next to the US Embassy, two blocks from the Malecon and a 15 minute walk to Hotel National. Just note the 4th bedroom of this Airbnb is on the balcony, which is huge by the way. It’s a large nice room with A/C but it caught us off guard that it wasn’t accessible without going through the french doors leading to the balcony. 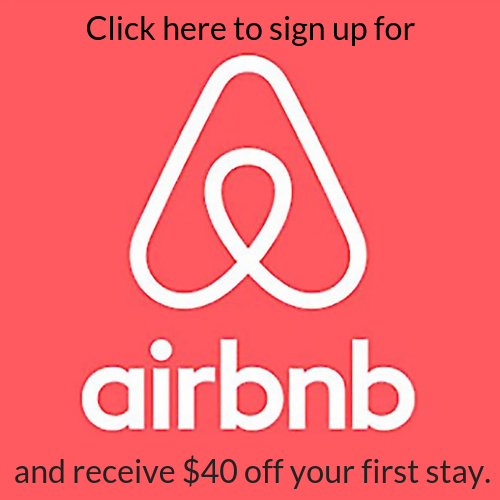 For $40 off your first Airbnb stay click here. Nervous about Airbnb? 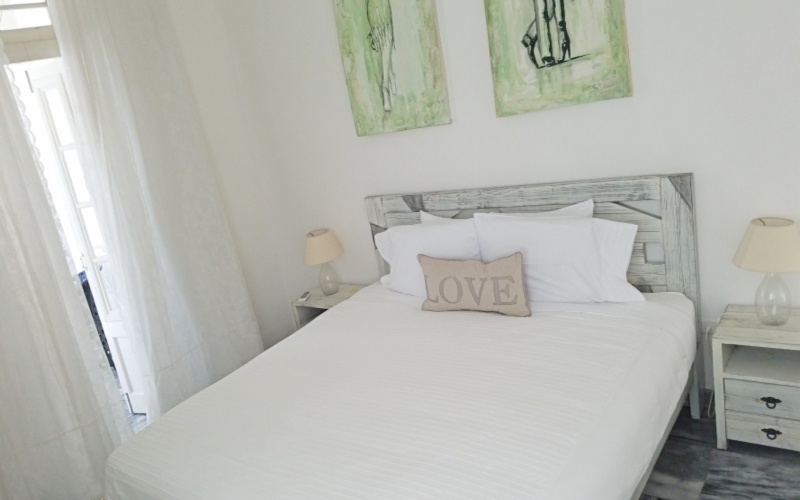 Check out my 8 tips to guarantee a great Airbnb experience! There is something for everyone to do in Havana. Whether you enjoy live music, dancing the day or night away, beaches, history, or strolling through a city Havana has it. Here’s how we spent our 4 days in Havana. After checking into our Airbnb we grabbed lunch and started our day. Our first stop was to the Museum of the Revolution. I had a lot of misconceptions about the Revolution in Cuba and I was so happy we made this visit. We were able to learn a lot and see the timeline of what happened when Fidel Castro came into power. 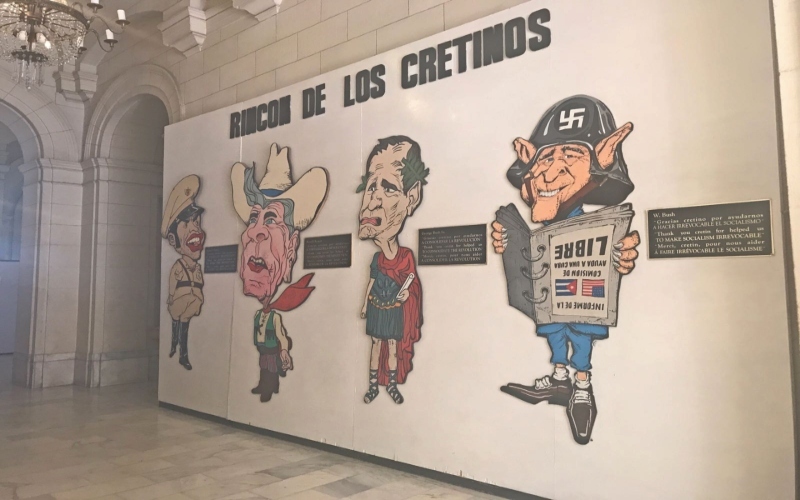 ​Next we visited the Museo de Ron at the Havana Club. The tour is 7 CUC and lasts about 30mins. At the end you get a shot of their 7yr rum. If you’ve done the Bacardi Tour in Puerto Rico or some other distillery tour elsewhere it’s basically that but a shorter one as it’s just a replica of the real factory which is non-accessible to the general population. 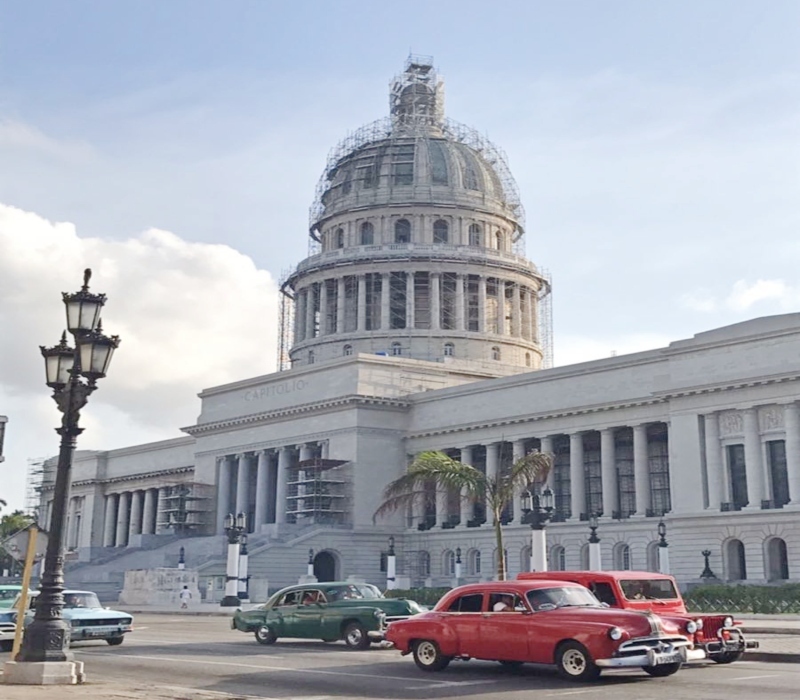 After tasting some Cuba rum we went to see El Capitolio, which looks nearly identical to the Capital in D.C. Unfortunately as it’s under construction entrance to the building is not possible and you can only admire the building from the outside. There was lots of scaffolding around the building and the stairs were also blocked off. It’s a shame as apparently the inside is breathtaking. We booked a convertible old car to take us to Finca Vigia, Ernest Hemingways Compound, about 30 minutes outside of Havana. Unfortunately it was raining in the morning so our tour guide had to cancel on us. We ended up negotiating a taxi for our adventure. For 60 CUC he took us from Vedado to Finca Vigia, then to Fusterlandia, and back to Havana. At both stops he waited for us while we explored the sites and the entire adventure took us about 3.5hrs. 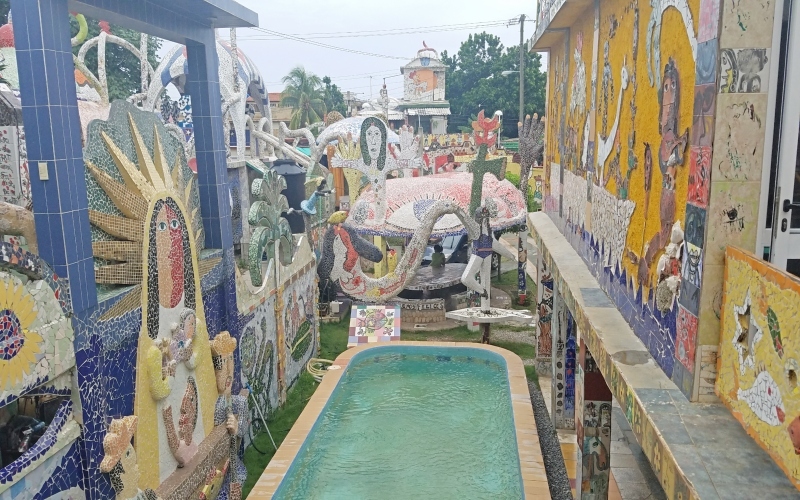 ​Fusterlandia is in the Jimenica’s neighborhood where the homes have mosaic art. ​Before our trip we all read and heard from friends who had gone that food in Havana was a hit or miss. Lunch and dinner our first night was horrible, so bad we were only able to eat the rice and beans from our meal. We told our taxi driver we were hungry and he took is to De Castropol a la Habana and thank God he did. The food was so good! The restaurant has an upstairs and downstairs but they have two different menus. We ate upstairs, which has A/C and we were very thankful for it as it was about 95 degrees with 100% humidity. We were able to walk to our salsa lessons from the restaurant, it was about 10 minutes away. We signed up for a 2 hour lesson at Salsabor a Cuba where we did a private group lesson where we did a private group lesson. The class was 12 CUC per person. The 1st hour we were by ourselves learning the different salsa moves and the 2nd hour all the various groups who were taking lessons separately joined together for us to do partner dancing. We had so much for and they were very accommodating of the kids, who they did not charge for. There is no A/C but they have lots of fans and the balcony is wide open. This is a work out, we left drenched! Since we heard the food was very hit or miss I tried looking up recommended restaurants prior to. I saw on another blog that dinner at Los Naranjos was excellent so I made a reservation via email losnaranjoscu@gmail.com before we left. The food and drinks did not disappoint! They didn’t have hi-chairs but we sat a table where half of it was bench against the wall and the kids sat there. It was so good we went back the next night.We refused to miss another night out and heard good things about the Salsa Club, 1830. It’s an outdoor club with live music and we saw quite a few people eating so they may serve food as well. The cover was 5 CUC per person and even if you don’t dance yourself you will get your money’s worth watching the professional salsa dancers doing all the tricks on the dance floor. No, the kids didn’t come with, my dad ended up coming on the trip last minute since two of our friends had an emergency so he babysat for us. Sunday we hit the beach first thing in the morning. I read it gets really crowded so our Airbnb host ordered a taxi for us from the night before to pick us up at 9AM. 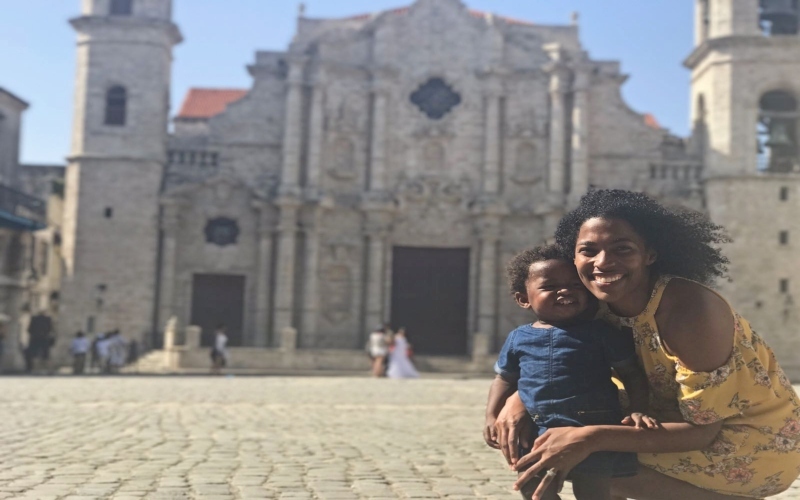 While we heard amazing things about Varadero, I couldn’t rationalize driving 2.5-3hrs each way just for a beach since we had limited time in Cuba so we went to Santa Maria del Mar, 30 minutes outside the center of Havana. You can rent two chairs and an umbrella for 6 CUC. ​Back in Havana it was time for lunch. Another recommendation we received was for Calle 25 MN. 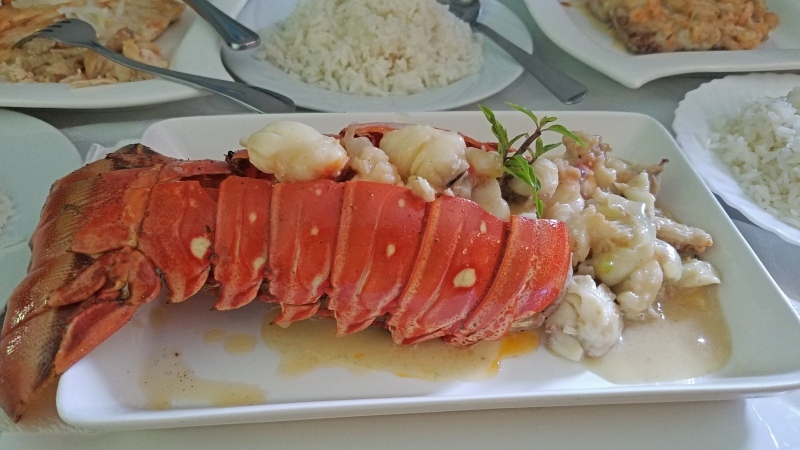 Most of us ordered the lobster with pineapples and we weren’t disappointed. 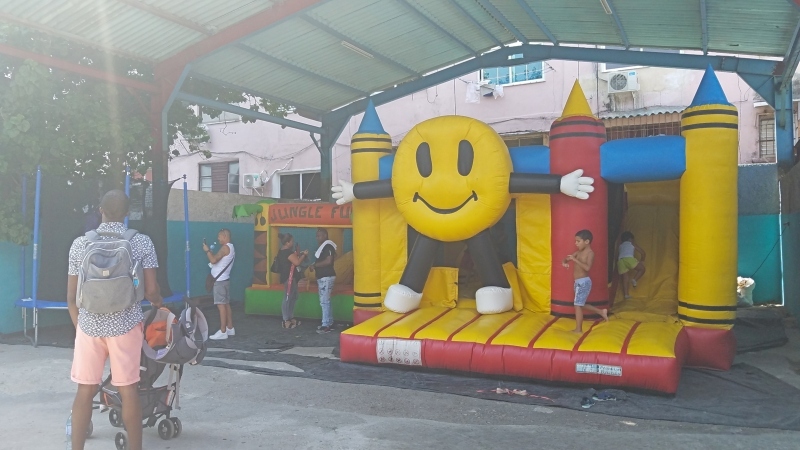 They even have a few bounce houses and a trampoline for the kids out back, covered by a tarp with fans to keep it cool. This was great for Jordyn as there is no such thing as a short meal in Cuba and I was able to keep her occupied after she ate while we waited for everyone else and the check. Bonus, they have A/C which we needed because it was about 100 degrees that day. Afterwards we took a taxi to Old Havana and walked around enjoying the live music and shops throughout. We made a stop to see Catedral de San Cristobal but unfortunately it was closed and we could only admire it from the outside. Next we took a taxi to Plaza de la Revolucion. You pass it coming from the airport to the city or when you’re going back to the airport. The taxis all wait for you there while you explore so if you can arrange to stop on your way into the city when you arrive or on your way to the airport when you leave it will save you some taxi fare as it’s kind of out of the way. ​On Sunday’s from 12PM-12AM they have live Afro Cuban dancing at Callejon de Hamel, check it out if you can. On our last day we took a day trip to Vinales. We booked through Discover Vinales and they only recommend doing the tour during the week as on the weekends the tobacco farm workers have off and you won’t be able to see as much. We booked the private Tour Habana Vinales 2. On the tour we learned the entire process of how cigars are made. It was very interesting to see how they flavor the cigars and how they can make them “organic” by removing 90% of the nicotine. These are considered cigars for pleasure as they are non-addictive. I’ve always been a fan of private tours because it gives me the flexibility to change something if I want to. We did that for the horseback ride, which was supposed to last 1hr. It was so hot outside we asked to only do a 20 minute walk and they said of course, whatever we want. We had an absolutely amazing time in Vinales our tour guide and overall tour through Discover Vinales was great and I highly recommend them. 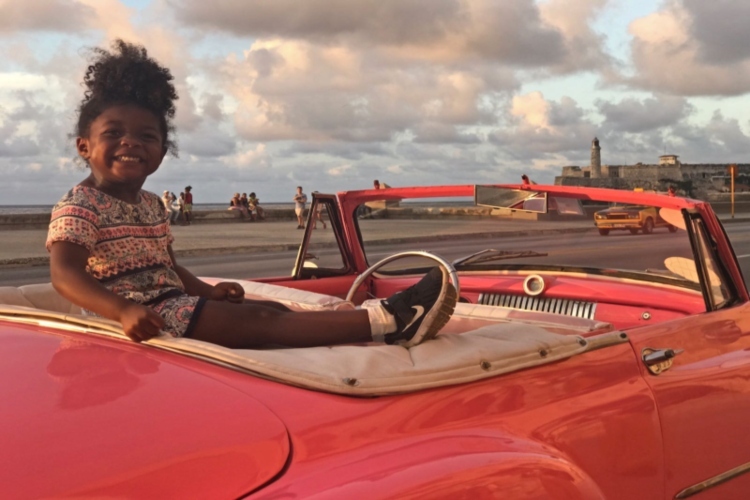 ​When we got back to Havana we hired an Old Classic Car, Jordyn wanted a pink one so she picked it out. We just drove down the Malecon and had a mini photo shoot before getting dropped off to dinner. Cuba does not accept US credit cards and we only saw one place that listed prices in USD. You must bring cash and you must have enough to last your entire stay as you also won’t find an ATM that accepts your US Debit Card. We exchanged $1200 for our stay and spent $1000 of it. Nothing except the Airbnb was paid for so this included what we spent on taxis, food, tours, entrance fees, drinks, etc. We traveled with 3 other adults so keep in mind we were splitting our taxis 5 ways. It’s better to bring more than you think you will need rather than be stuck with no cash. Negotiate, negotiate, negotiate! You pretty much be limited to taking taxis while in Havana. Classic cars are expensive so to save money besides the day we knew we wanted to do a Classic Car photo shoot we took regular car taxis. To give you an example we were leaving Museo de Ron and heading to El Capitolio and a classic car was charging 15 CUC while a regular car charged us 5 CUC only.Another tip is once you negotiate a price pay as soon as you get in the taxi. If you wait until you get to your destination they may tell you a different price. This happened to us once, the driver told us 5CUC but when we got to our destination he said 10 CUC, “I said 5 CUC for you 2 and 5 for you 2.” My husband told him if he wouldn’t give us back the correct change that he wanted all his money back, he reluctantly gave us 15 CUC back from the 20 we gave him. There was only 1 vehicle, the one we took to Vinales that had seat belts so I honestly believe bringing a car seat in a waste unless you were renting a car and knew your rental would have seat belts to install it.We brought the stroller with us for Jordyn on the first day but really got in and out of taxis from place to place that we never used it. You aren’t allowed to use strollers in the Revolution Museum or the tour at Museo de Ron. We left it home the next few days and only brought it back out for the day we walked around Old Havana. It definitely came in handy that day as she napped most of the time we were walking around.We used the carrier for Kennedy when she was tired of walking, while she napped during the 2nd half of our salsa lesson and on our horseback walk in Vinales. Luckily we have the Ergobaby 360 Cool Air Mesh which is breathable because I couldn’t even imagine how hot we’d both be if not. The humidity in Cuba in September was crazy so we tried to keep her out of the carrier as much as possible. Download this app before getting to Cuba as the likelihood of you never being able to connect to the internet is quite high. 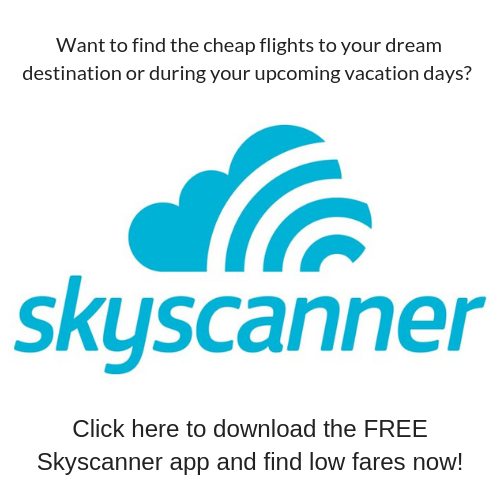 The app allows you to see your location without wifi and be able to get directions. You can also use this to help determine how far you are from somewhere you may want to take a taxi to so you know if a driver is over charging you. Thank you so much Carla! We booked our tour with Discover Vinales prior to arriving to Cuba as well as our Salsa Class. We did prebook a car to take us to Finca Vieja but they cancelled on us. We just showed up to the Rum Distillery. I always prebook tours to prevent wasting time once we arrive with looking for something, I also really like to read reviews and make sure they have great feedback. You guys are going to LOVE Cuba, enjoy your trip!! Monet this is so helpful, thank you! 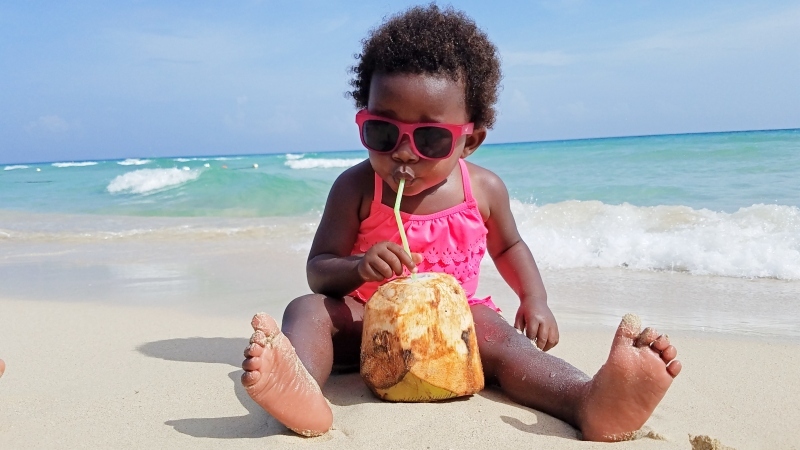 I’m planning a trip to Cuba for May with my 18 month old and 5 year old. Your blog and IG are both amazing :-)!